Couscous with halloumi, preserved lemons, and courgette. I adore halloumi, griddled, and served with salad or vegetables. I have bought a jar of preserved lemons from my favourite farm shop Fullers and am going to make a big plate of couscous salad to add to the lunch table today. The preserved lemons turn this dish from something good to something really very good! Boil the kettle. Make up the couscous. Season with salt and pepper. Fork through to separate the grains. Add half a tsp of cumin powder and coriander powder and gently mix. Heat a griddle pan. Cut the courgette in half and slice each half lengthways into 4-5 slices. When the pan is hot add the slices and griddle for a minute or two on each side. Remove to a plate. Cut the halloumi into slices and griddle for a couple of minutes on each side. Remove from the pan. Cut 1 preserved lemon into pieces. Cut the courgette slices into chunky pieces. Chop the garlic, tear the mint leaves. Mix into the couscous. 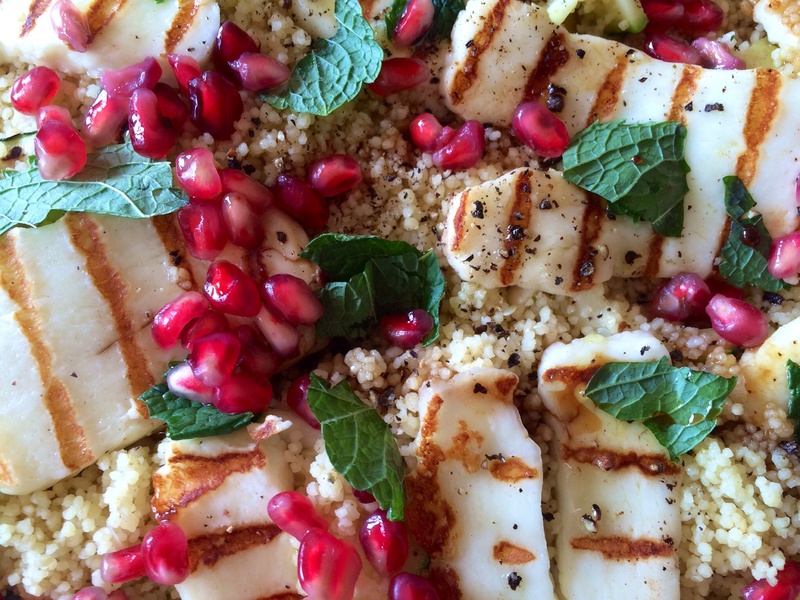 Top with the slices of halloumi and the pomegranate seeds. Make a dressing with 3 Tbs olive oil and 1 tbs pomegranate molasses. Whisk together and pour over the salad. Season with black pepper. 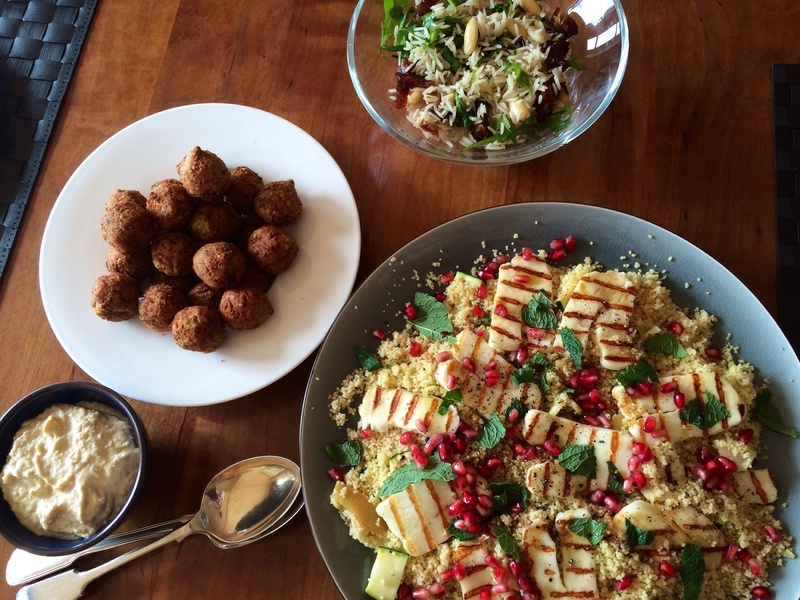 Serve with hummus, falafels and a green salad. Preserved lemons and pomegranate molasses are available in most supermarkets or online from Ottolenghi. ← Sweetcorn and sweet potato soup.